As you can see, I’m not organizing my calendar around tasks—but around themes. I could cut an ideal Monday into 4 one-on-one meetings, 2 project update meetings, time to review last weeks analytics, emails etc. That would drive me bonkers! The goal of the ideal week is not be your schedule, but it’s to give direction to your schedule. Think of an ideal week like city zoning. In any city they want to make sure they have a good mix of commercial, light industrial, high density residential, and low density residential. City planners section off the city into zoning areas so that as people want to develop property, they can—but they keep the desired balance. An ideal week should zone off your time so that your calendar can get filled in organically, but still make sure that your life has the right balance of priorities. 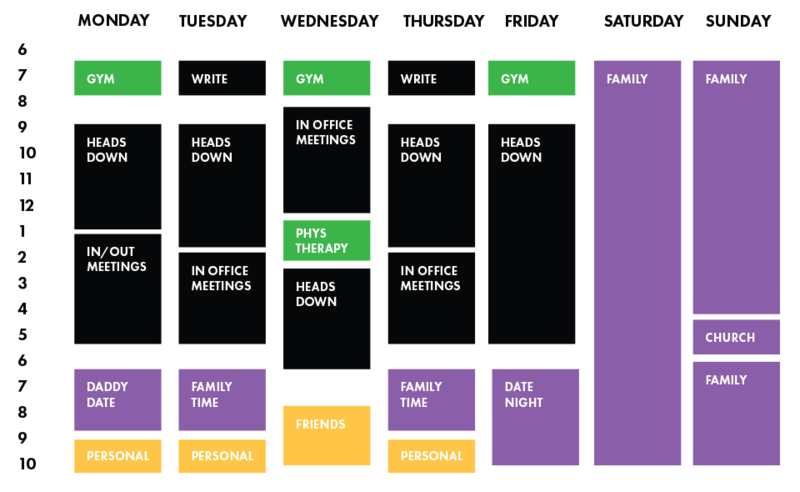 Do you have any advice for planning an ideal week?